I Love the Sweet Stuff! The sap is running in New England and I got some first hand insights and some surprising information when I visited Massachusetts and Vermont recently. The surprise: Maple syrup contains an abundant amount of naturally occurring minerals such as calcium, manganese, potassium and magnesium. And like broccoli and bananas, it’s a natural source of beneficial antioxidants. According to the Vermont Maple Sugar Makers Association “Maple syrup is also a better source of some nutrients than apples, eggs or bread. It’s more nutritious than all other common sweeteners, contains one of the lowest calorie levels, and has been shown to have healthy glycemic qualities”. I always feel guilty when I slather on the maple syrup on pancakes and this information just made me feel a little better! Also, according to the Association, “Maple syrup was the original natural sweetener. Native Peoples in North America were the first to recognize 100% pure maple syrup as a source of nutrition and energy. Since then, researchers have been documenting that maple syrup has a higher nutritional value than all other common sweeteners. In addition, researchers have found that pure maple syrup contains numerous phenolic compounds, commonly found in plants and in agricultural products such as blueberries, tea, red wine and flax-seed. 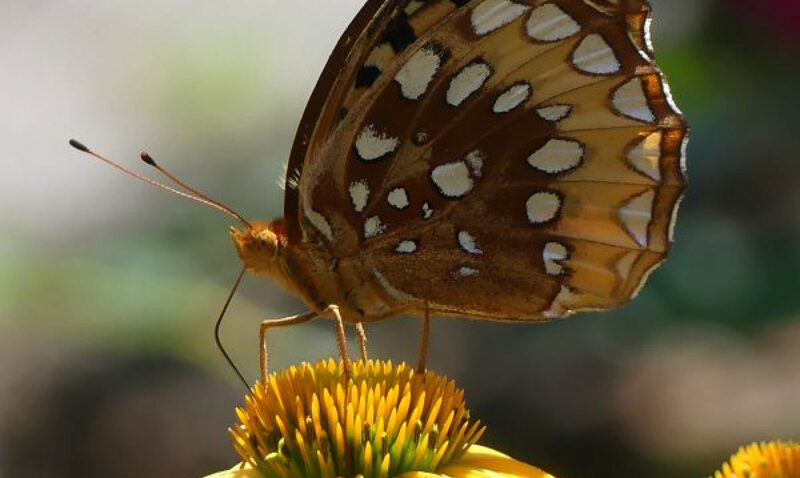 Some of these compounds may benefit human health in significant ways”. Another surprise that I learned is that maple syrup is only produced in North America, as far west as Minnesota, including Canada and as far south as Virginia, making this a uniquely North American product. I visited a lovely farm in Massachusetts that has a sugar house where the maple sap is collected, boiled in a large evaporator into syrup, and then bottled for use. The outdoor temperature has to reach around 43 to 45 degrees during the day and freezing at night for the sap to start running . And the season lasts from 6 to 8 weeks depending on the temperatures. 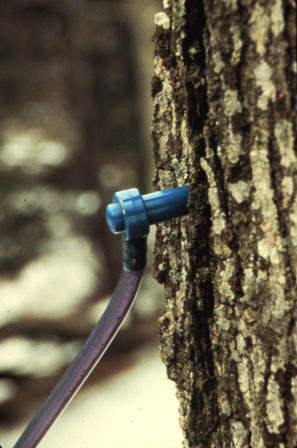 Instead of the old-time buckets, most maple syrup makers use tubing connected to a tap that is hammered into the tree and connects with miles of tubing to a central collection tank. 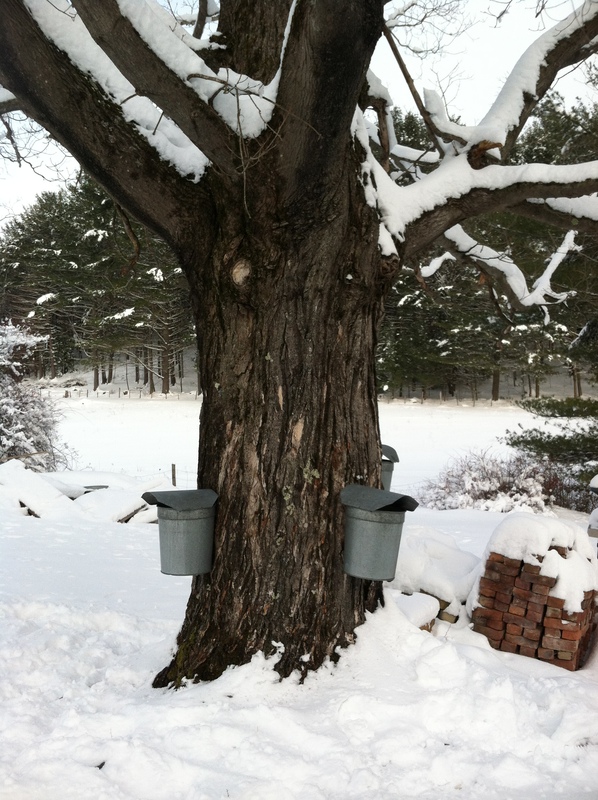 In place of the labor consuming process of going to each bucket to collect the sap (and there can be hundreds or thousands! ), the farmer just empties the central collection container. 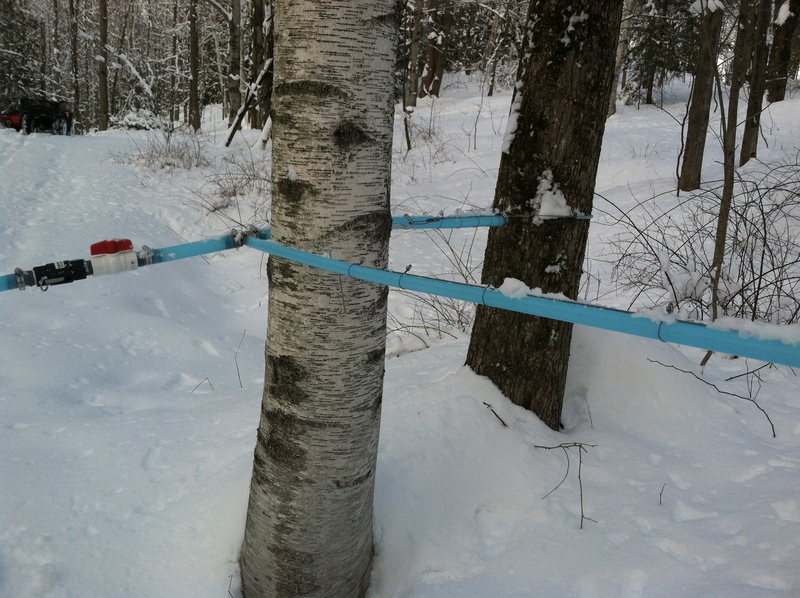 The taps are kept in the tree the whole sugaring season or until the sap stops flowing. The sugar maples were all marked with orange paint earlier so that the farmer can plainly see what trees to tap. The tubing extends to all the taps which run into laterals, which then run into the main line tubing and the tubing can run for many miles. The tubing is supported with wiring and at intervals you see a Y-branch of a limb of a tree stuck into the ground supporting the line. 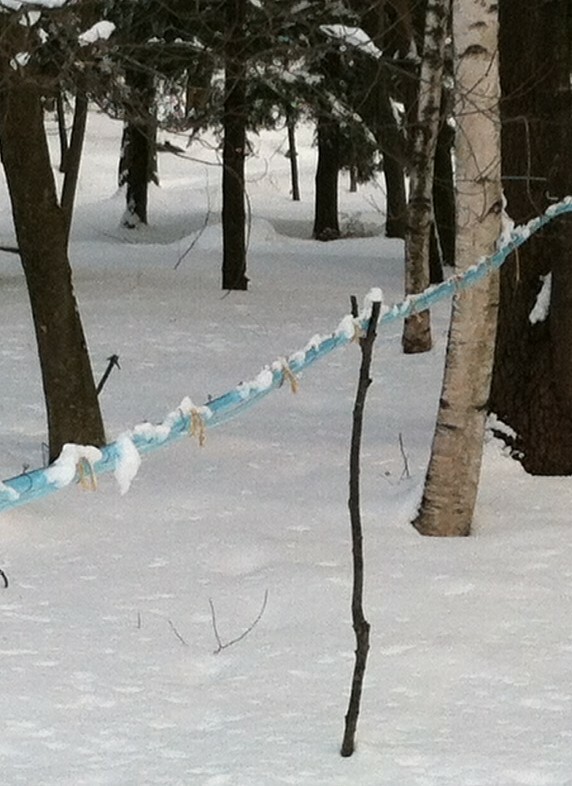 When you stand in the sugar bush, you are surrounded by a spider web of blue lines all around you. It all flows with gravity so it is helpful if your sugar maples are on a slope with a storage tank at the bottom or low point. Consider these facts; Fresh sap contains between 1 to 6% of sugar content and maple syrup has between 66 to 67 % sugar content. 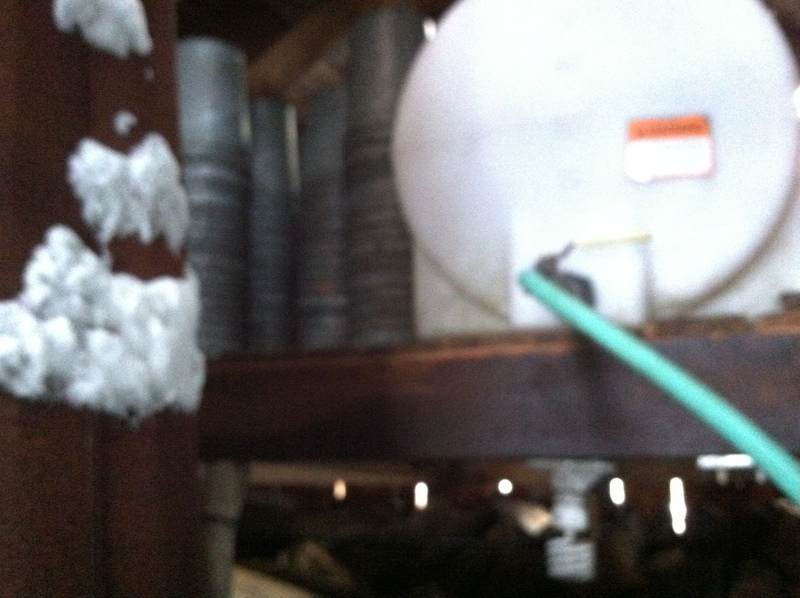 To reach that concentration, gallons and gallons of water have to be evaporated out of the sap. 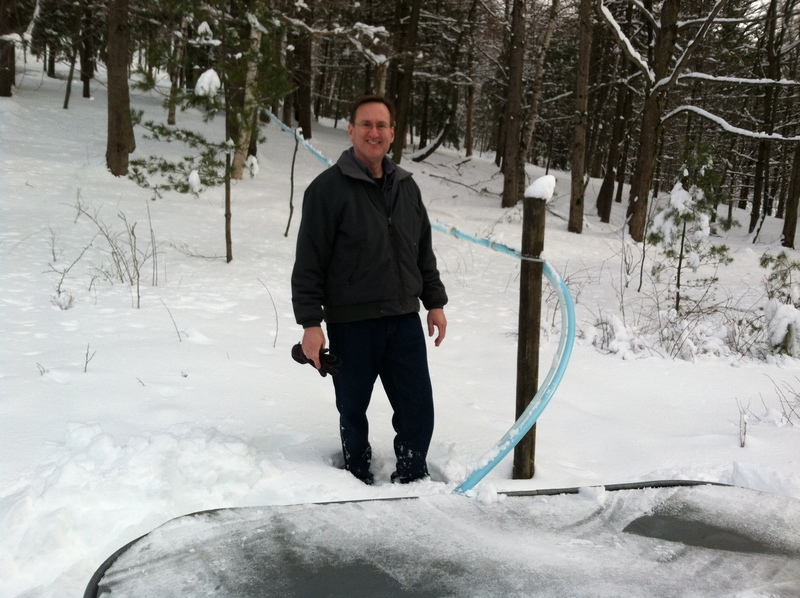 So, you need about 45 to 50 gallons of sap to make just one gallon of syrup! 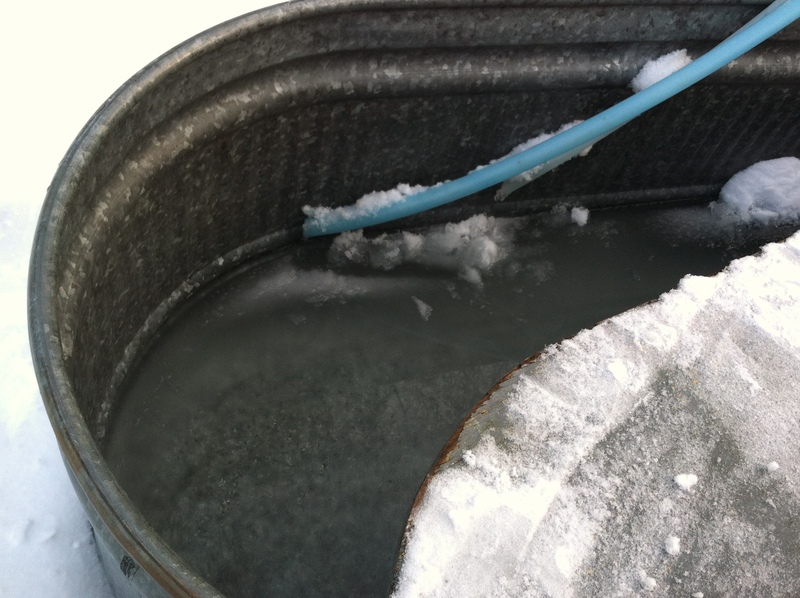 The sugar content of the starting sap determines how much has to be evaporated. If the sugar concentration of the finished product is more than the 66 to 67%, the syrup will crystallize. If the sugar content is too low, then it could spoil. To check this critical factor, a sugar maker uses a hydrometer, which measures the sugar content. To make this dramatic transformation, the sugar house has three things: a storage tank containing the sap, the evaporator, and a fuel source. 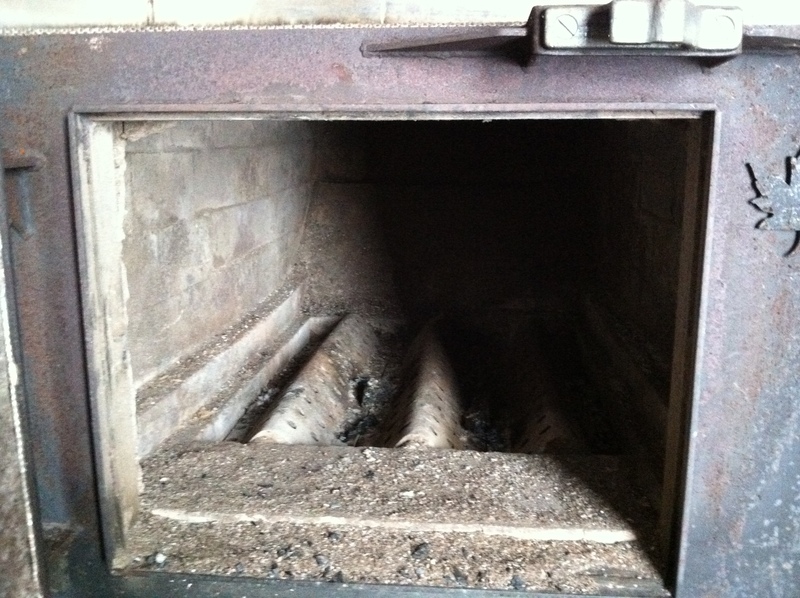 You can tell an evaporator is at work by the amount of steam they produce and vents out the top! 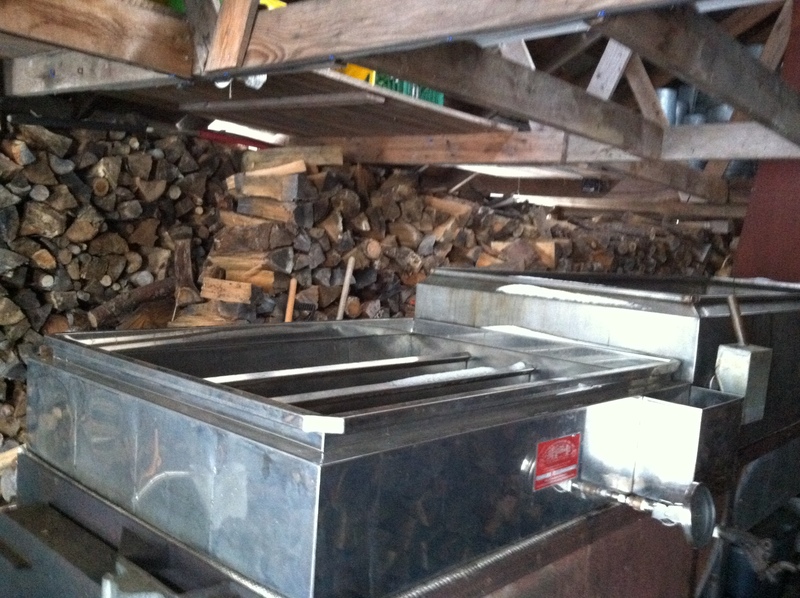 A full cord of wood, 4′ wide x 4′ tall, and 8′ long is need to produce 25 gallons of syrup. Lots of wood is cut all year and stacked to dry in anticipation of making the syrup in the winter. The farm that I visited used mostly pine and spruce wood that they cut down in clearing different areas of the sugar bush. 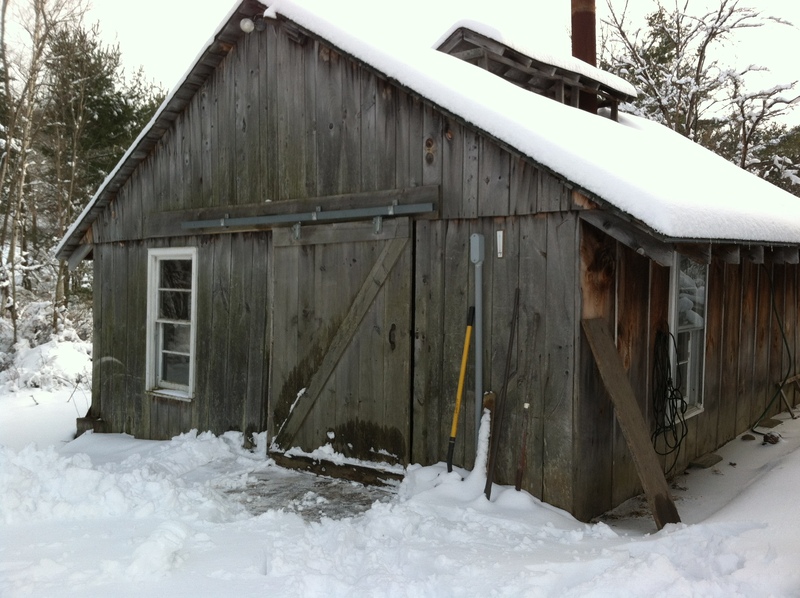 Sugar bush is the name of the forested area that the sugar maker taps for his sap. The syrup is bottled into jars or plastic containers and graded by flavor and color. The grade is determined by how much light passes through it. Grade A is lighter, and thus more light would pass through it than Grade B. I prefer the darker Grade B syrup as it has a heartier maple flavoring. 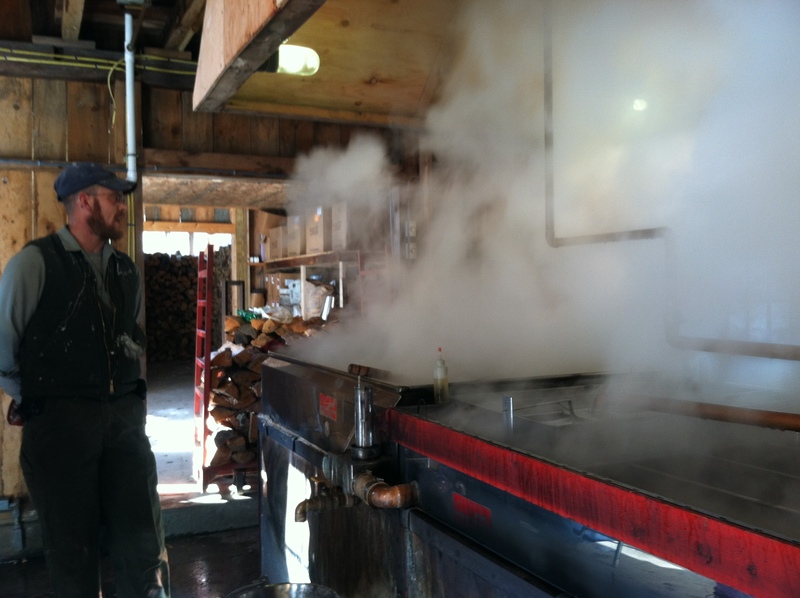 In total, there are 2 major grades of syrup with subsets of each grade. Other products are made from maple syrup, such as maple candy, maple sugar, and maple cookies, and I love them all. I always have pure maple syrup in my pantry to use in cooking. Maple syrup is a lot of hard work and expensive to produce. Evaporators can run into thousands of dollars and the other equipment is also expensive so this is a labor of love, not for money. 1/4 cup maple syrup 2 tbsp Dijon mustard 1/2 tsp garlic powder 2 tbsp olive oil 1/2 tsp salt 1/4 tsp pepper 1/2 cup coarsely chopped onion or 20 pearl onions, peeled 5 cups coarsely chopped or sliced veggies of your choice; turnips, parsnips, rutabaga, carrot, potato, yams, beets and/or golden beets. Preheat oven to 425 degrees. Toss veggies and onions with the olive oil, salt and pepper on a baking pan. Roast in oven for 20 minutes, then remove and re-toss on baking sheet. Cook 15 minutes more. Toss again. Cook another 15 min. Combine maple syrup, Dijon mustard and garlic powder in a small bowl. Drizzle the maple mixture over potatoes and veggies and mix to coat well. Cook again until veggies (beets and potatoes will take the longest) are soft and glaze starts to caramelize and brown a bit. Thanks! I really loved learning about the heatlh benefits of maple syrup! Thank you for teaching me something new today. That was an amazing amount of good information. I prefer maple syrup to the manufactured stuff even though it’s so much more expensive. Now I see why and it’s worth the price. I’m curious now as to the comparison of health benefits between maple syrup and honey? Hmmm. Honey is also very beneficial with lots of trace minerals, vitamins, pollen, and protein. It is 80% sugar so is a little bit sweeter than maple syrup and sugar. But I prefer to get my sweetener from either maple syrup or honey because of the extra bonus!